Since I have started playing around with lacto-fermentation, I have discovered some really fun resources on the web–other folks who seem to be fermentation obsessed too! So fun. 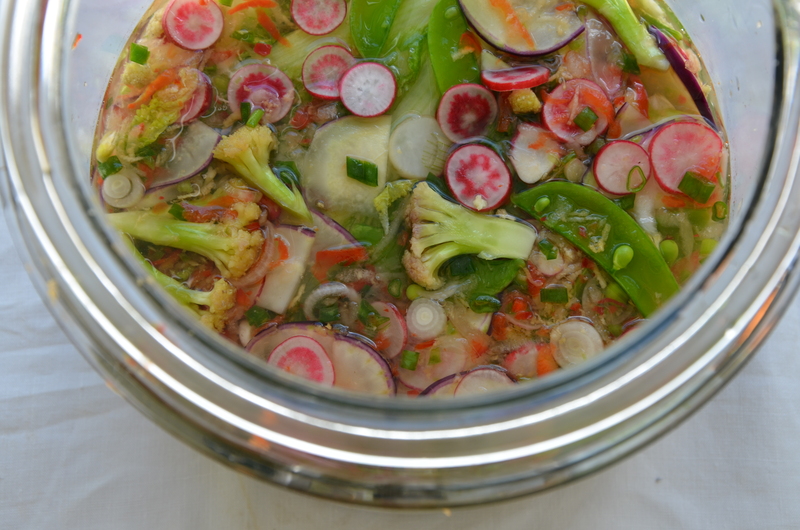 8 Reasons to Eat Fermented Foods. Snip or break wakame and kombu into 1/2 inch pieces in a medium-sized saucepan and combine with 4-6 cups water. Bring to a boil and simmer, covered, 10-15 minutes. 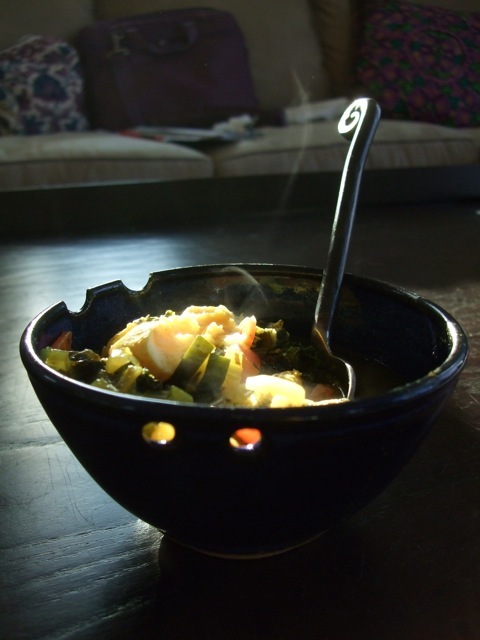 Optional: soak 1/4-1/3 cup arame seaweed in cold water for 5 minutes and then drain and stir into seaweed broth. Add chopped onion, garlic, ginger and carrots to simmering broth. 5 minutes later, add zucchini, kale, and scallions. Simmer for a few more minutes. When veggies are looking bright and yummy, decide whether you would like to have a coconut-curry soup, or miso. Move enough soup for a serving to a small saucepan and return to a high simmer. Carefully break two eggs into the soup and simmer until eggs are as done as you like them. While the eggs cook, dissolve 1 tablespoon of your favorite miso in 1/4 cup of the broth. When the eggs are done, take soup off of heat and gently stir the miso broth back into the soup (miso doesn’t like to be boiled), and season with salt or dulse flakes or some sort of soy condiment. Serve topped with chopped cilantro. For Tofu instead of Egg: add to soup with the first batch veggies and turn off heat and stir in dissolved miso when veggies look ready to eat. Stir approximately 1/4 cup of coconut milk (lite works fine, or skip the coconut altogether for a lighter meal) and 1 teaspoon of green curry paste per serving into the soup and season with salt and a little turmeric. Cook eggs the same way as with the miso soup. Squeeze in some fresh lime juice, garnish with cilantro and serve. Wash and combine your favorite mix of greens and chopped or shredded crunchy veggies. 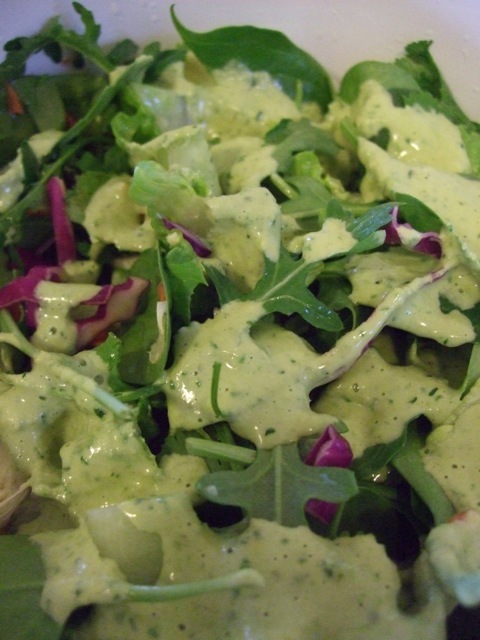 To pair with this dressing, I like to use a combination of romaine, arugula, shredded red cabbage and carrot, chopped celery, cuke, endive, and artichoke (chopped small-ish so the taste is not over-whelming) and some cilantro leaves. Put at least a heaping tablespoon of sesame tahini in a blender or a container in which your immersion blender will fit. Pour in a few tablespoons broth from the soup – miso or curry – and stir to soften the tahini. Add 1-2 cloves garlic, an artichoke heart and some of the liquid from the artichoke can, some fresh cilantro, a squeeze of lemon and a dash of salt. Blend well. Use more artichoke liquid to adjust consistency. Adjust salt/lemon juice. Toss with salad and serve. Sprinkle with toasted sunflower seeds for an extra crunch. This dressing would also go well over steamed veggies and rice or poached eggs.